Basecamp is perfect for teams who want a single space to collaborate on projects. However, it only has basic reporting tools and lacks more in-depth features commonly found on other project management platforms. Basecamp is less for traditional project management tasks such as resource planning and long-term scheduling, and more aimed at real-time communication and collaboration. The platform offers to-do lists, calendars, due dates and file-sharing along with its own chat room, Campfire. Users can keep track of priorities and actionable items. Basecamp integrates with a variety of applications and has its own apps for iOS and Android. Basecamp pricing is based on one flat rate of $99 (£78) per month no matter how many users you have. It offers a discount to non-profits and is free for students and teachers. There is a 30-day free trial where no credit card details are needed. Basecamp includes messaging, real-time chat, to-do lists, schedules, file storage, documents and automatic check-ins. Users can run as many projects as they like for the same price. There is no minimum contract, so you can cancel whenever you like. 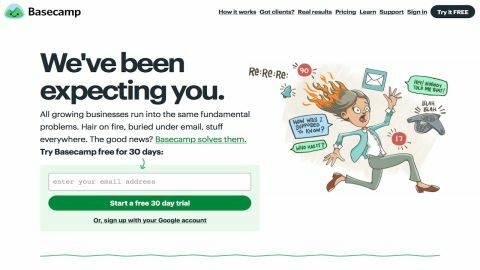 Basecamp has said that it’s willing to extend the 30-day free trial for some users. You’ll need to contact them directly about this. Basecamp walks you through setup making it a very straightforward process. Just enter your email and answer the relevant questions. These include your company name, your own name and title, what you want to use the platform for, what type of projects you are running, and whether you want to invite members of your team to join. A pop-up video will launch once all this has been completed – it’s a short (two minute) tutorial on the basics of Basecamp. Your dashboard will then be displayed. You can edit your profile settings such as name, avatar, password, title, email, theme color, change your login info, edit the first day of the week and time-zone from the top-right of the screen. Users can also access ‘Adminland’ from the top-right of the dashboard. From here, you can add/remove people, administrators, edit access, rename a company, customize your home screen, change message categories and move projects from Basecamp 2 to Basecamp 3. Account Owners can upgrade to a paid account, add other owners, rename the account, view everything in the trash, access any project/team, export data and cancel the account from here. Basecamp has a ‘focus mode’ which can be switched on or off. Focus mode turns off notifications and orange unread badges for a certain length of time, thus allowing you to focus on the project, as the name suggests. The interface can be a bit overwhelming initially. There seems to be a lot happening on the main dashboard page. Your company’s ‘HQ’ is highlighted at the center of the dashboard. This is where any important announcements are made in relation to teams and projects. You can access your assignments, bookmarks, schedule, drafts, recent activity and boosts from the list beside the HQ section. While it is handy to be able to access these options, they might be better placed on a pane to the left of the dashboard (a layout more commonly seen with other project management platforms such as Wrike). Your Teams section is displayed underneath the announcement area. Features shown here depend on the choices you made during setup. For example, we chose finance, mangers, marketing, R&D and sales. These can be removed or edited at any time by clicking on the relevant card. Projects can be viewed at the bottom of the screen. Folks who use similar templates can create a ‘re-usable’ template from here. Home, Pings, Notifications, Activity and Search can be accessed from the top of the dashboard. Support is available from the bottom right of the screen. This includes Basecamp’s knowledgebase along with chat support. Campfire is Basecamp’s integrated chat room. Users can discuss topics in relation to the project and be kept abreast of any new developments or ideas. It is a fun live chat app which incorporates sounds and emojis, plus you can also share attachments. The chat room can be accessed by all users and guests who have the shared URL. You can turn off guest access if you only want team members around the Campfire. Users can send each other instant messages via Ping, which isn’t specific to each separate team or project. You view notifications from the top of the main dashboard screen. Ping notifications can be viewed no matter what page you are currently using. However, there is no pop-up chat box as seen in Zoho Projects. This means that users can’t read chats while working on a particular project. Basecamp allows you to not only send messages to clients but also to let them share in the project with you and your team. You can assign clients to-do lists, share files or folders, schedule events, meetings and chat using instant messaging. You control everything the client sees. Projects have options such as ‘private to our team’ or ‘the client can see this’. Each project is set to private by default. This way you can pick and choose which items your clients can access. Clients can’t create new projects, add people or modify tools. They can’t see the HQ or the Teams section. They can only view sections you specifically authorize. Basecamp uses automatic check-ins to keep track of the team’s progress. You can ask each member what they’re working on and what their priorities are for that particular day. Users are asked once a week to share a photo of themselves. The platform asks teams to share recipes every other week and once a month it asks for book recommendations. You can set the frequency of check-ins, and everyone in the project can view the responses. Check-ins can be paused, edited or deleted at any time by clicking on individual project cards. You can add or delete questions as you see fit. It’s worth noting that Basecamp integrates with a variety of third-party applications. These include Zapier, TaskClone, ProjectBuddy, Field Trip, MinterApp and Ganttify amongst others. Basecamp also has mobile apps for both Android and iOS. These offer the same functionality as the web-based version. Basecamp works more as a collaboration tool rather than a full-on project management solution. Once you become acclimatized to the overly busy appearance of the dashboard, it is very straightforward to manage. Everything is laid out on one screen, and you can access your projects and team members easily. The platform’s chat room and instant messaging are handy features. Automatic check-ins ensure that everyone is on the right page, and Basecamp tries to make the work environment that bit more interesting and fun. While the flat rate pricing structure is fair, users could end up paying more when it comes to integrating other applications. This is due to the lack of certain tools such as time-tracking, more in-depth reporting, and invoicing. These can be integrated but at a cost. Overall, Basecamp does exactly what it says on the tin, and works perfectly as a collaboration tool.